During the International Year of Soils in 2015, FAO drew attention to the key benefits of healthy soils, including its important role in food production. The Milan EXPO 2015 also highlighted the need to ensure healthy, safe and sufficient food for all. Important interconnections emerge: the key role of healthy soils and pulses to address future global food security and environmental challenges as well as to contribute to balanced and healthy diets. “The International Year of Pulses can be a valuable opportunity to reflect not only on the high nutritional values of pulses but also to broaden the discussion to the consequences of pulses consumption for economic, social and human-well at the heart of the 2030 Sustainable Development Agenda”, said Andrea Olivero, Italian Deputy Minister of Agriculture, Food and Forestry Policies who addressed the seminar. Since millennia farmers have been aware of the significance and potential impact of pulses for human nutrition and agricultural systems. Pulses were cited for their role of nourishing people during the Roman Empire in the Rerum Rusticarum (37 BC) as well as in some recipes of the Native American cuisine. Today, pulses represent a major source of protein in many developing countries, especially among the poorer sections of the population who rely on vegetable sources for their protein and energy requirements. 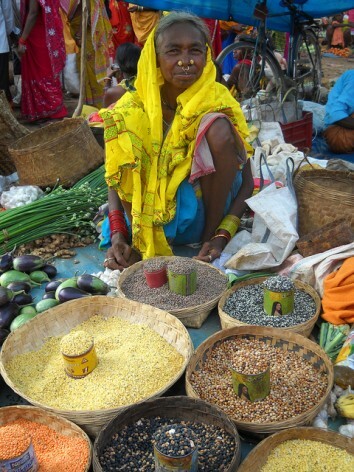 Pulses play an important role in the nutritional security of a large number of people. Pulses offer significant nutritional and health advantages due to their protein and essential amino acid contents as well as being a source of complex carbohydrates and several vitamins and minerals. Additionally, in view of the biological nitrogen fixation capacity most of leguminous species, pulses and legumes are important components of a healthy diet, said Francesco Branca, Director of the Department of Nutrition for Health and Development at the World Health Organization (WHO). Both WHO and FAO recommend that people eat at least 400 g of fruit and vegetables per day. This is equivalent to consuming about 25 g of dietary fibre per day. Pulses are also functional to prevent obesity and type 2 diabetes, to reduce the risk of heart diseases, blood pressure and certain types of cancers. “In India, initiatives to enhance lentil consumption played a crucial role in the treatment of anaemia among children” said Mahmoud Solh, Director General of the International Center for Agricultural Research in the Dry Areas (ICARDA). Big opportunities are offered by the multidimensional relationship between pulses and soils, as paramount components of food security: nutrient-poor soils, as a non-renewable resource, are indeed unable to produce healthy food with all necessary micronutrient for a healthy person. Soils are under threat. 33% of land (of total land worldwide) is moderately to highly degraded due to the erosion, salinization and, compaction, acidification and chemical pollution of soils. Agriculture is critical to meet the challenges posed by hunger and malnutrition. A sustainable management of the world’s agricultural soils and sustainable production have become imperative for reversing the trend of soil degradation to ensure current and future global food security. Olivero pointed out that “pulses are sustainable, resilient and soil-friendly, feeding the soil biology and increasing microbial activity. Growing pulse crops in rotation with other crops enables the soil environment to support flourishing of these large, diverse populations of soil organisms”. Michele Pisante, from Italy’s Council for Agriculture Research and Agrarian Economics (CREA), noted experiments showing that rotating legumes with grain crops could save up to 88 kilograms of nitrogen per hectare in Europe, where fertilizer use is high by international standards. There has been a sharp global reduction in pulse production compared to cereals since 1962, and reversing that would lead to virtuous outcomes including lower carbon costs per unit of glucose, Pisante noted. Paola De Santis, a researcher at Bioversity International, showcased the organization’s research in Uganda, China and other countries on improving bean seed quality to enhance productivity as well as genetic diversity of key pulses varieties, which can be leveraged to boost plant resistance to diseases and pests. may be more available to larger farm enterprises, pushing family farmers onto marginal lands, she added.